IBM has teamed up with HTC to try and bring Android handsets to the business sector, which is currently dominated by Apple and Blackberry devices. A series of smart business applications have been developed by IBM to run on HTC smartphones and tablets – although theoretically they should be relatively easy to port to other devices if IBM eyes the bigger Android prize. Targeting the enterprise market is a new direction for HTC, which has only recently begun to shift some focus to the area, as they look to grow and hit 100-million devices globally. Due to the iPad's huge success in the workplace as well as for sofa browsing, increased focus is being put on Android tablets by manufacturers and developers to gain a slice of the enterprise pie. HTC will be looking at new Android tablet and smartphone devices, using its partnership with IBM to extend appeal to the business market. HTC will allow businesses to create their own applications, with help from third party developers, for their HTC devices to compliment the range of business tools which will already appear on the devices. This will provide a more personalised business experience and allow the tablet to be tailored to suit a company's needs. This level of customisation is something the iPad cannot offer and could see HTC succeed in the enterprise market. 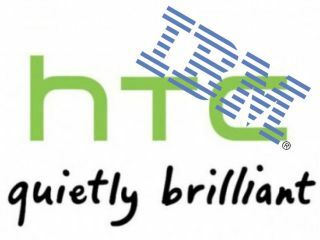 We look forward to seeing what new tablets HTC produced and what the IBM applications offer up. Would you consider an Android phone or tablet for your business?